As soon as we pulled up to the base lodge at Utah's Deer Valley ski resort, my three and one half year old daughter Eve bounded out of the car, pulled me towards the chair lift and demanded a ride up the mountain. It was only after the lift operator told her, with an air of authority no parent can muster, that she needed boots and skis to ride the lift that she was satisfied to wait until the following day when we were to begin our ski vacation in earnest. Little could I have imagined that by week's end she'd be riding that very same lift with me, and cruising down the mountain with the confidence of an Olympian and exhilaration matched only by her father's. Putting young children on skis is liberating, both for kids and parents alike. But if approached incorrectly, a bad experience at four, five, or six can forever sour a child on skiing and shortcircuit parents' efforts to organize winter ski vacations the entire family can enjoy. There was a time when children so young were a rarity on the slopes. But no longer. Technological advances in equipment and clothing enable parents to get kids ski-ready with a minimum of fuss. Gloves and outerwear are now warm and weather-resistant. Ski boots don't have to be broken in...or laced. And a revolution in ski bindings in the last decade has meant that your average four year old can now put his own skis on...and take them off, quickly and safely. Sal Raio, Deer Valley's Director of Ski School Operations, explains that "parents are putting demands on us to teach their kids to ski within a certain amount of time." At Deer Valley, that means four to six days. And for Eve and her preschool classmates in `Learning to Ski 101', it proved to be more than enough time. We selected Deer Valley for Eve's first ski outing for a number of reasons. First, it is less than an hour on a major interstate from Salt Lake City Airport. After the four and one half hour flight from Dulles, it was a pleasure to speed out of town in our rented car to the resort. We also spent a few nights at the Quality Inn in Salt Lake --a favoriate of budget conscious skiers. Every morning after breakfast at McDonald's across the street, Eve and I rode the convenient shuttle bus to the mountain in less time than it takes to drive from Rockville to Dupont Circle. Deer Valley --tucked almost unnoticed a couple of miles down the road from the much larger Park City resorts, is renowned for its commitment to making skiing a pleasurable experience for both parents and children. The pace is unhurried and the day trippers are few. There is always a table available for lunch, and mountain staff are trained to be solititous of skiers' needs. Yet Park City, with its restsurants, stores, and other diversions is only minutes away. Deer Valley reminded me of the relaxing ambiance at small family resorts in New Hampshire - like North Conway's Mount Cranmore, where I grew up skiing. Ideally, introducing a child to skiing begins long before you arrive at the slopes. When Eve was one and one half, for example, we purchased a $20 pair of 70 cm skis with plastic bear trap bindings. She was too young to use them on snow, so we put them in her playroom-- along with her other toys -- and gave her the opportunity to slide along the rug, and eventually on our snow-covered backyard, whenever it fancied her. For two seasons -- during Eve's second and third year -- I also skied with her in a child carrier on my back. Admittedly, this option isn't for everyone. For Eve however, skiing with me was a wonderful introduction to the sport. It gave her a sense of the speed and fun of skiing, not to mention the excitement of gondola and chairlift rides. Perhaps most important, these experiences, and the family ski videos and pictures she viewed almost as frequently as Pee Wee Herman, instilled in her a sense of anticipation that one day she too would be skiing under her own power. As Eve's excitement upon our arrival at Deer Valley demonstrated, she was ready to strike out on her own. We proceeded directly to the ski shop to be outfitted with rental skis and boots[no poles for beginners]. Unless you live in ski country, it makes no sense whatsoever to purchase ski equipment for children so young. The hassles of transport and the short lifespan of anything a growing child uses make renting the preferred choice. Eve slipped on he ski boots enthusiastically, in contrast to an earlier attempt the previous year, when the novelty of the close fitting boots produced screams and hollers. That evening she `clunked' around the condo in her new acquisitions as we laid out her ski clothes. Comfort and warmth are essential to enjoyable skiing. We chose a March vacation date primarily because the beautiful sun and spring skiing conditions which usually prevail at this time make it the optimum time to learn how to ski. Everything else being equal, skiing under the March sun in the Rockies is preferable to fighting the January chill in New England, especially for young children. Eve dressed in thermal underwear, a turtleneck, sweater, her two piece winter outfit, and mittens with Velcro fasteners. She needed all this, and a hat and neck gaiter drawn up over her nose, on our one day of snow. Otherwise she could mix and match her layers, by taking off her jacket after the morning chill dissipated for example. Ski school director Raio cautions that most parents forget to equip their kids with sunglasses and goggles sized especially for children. Suntan lotion is also a must. Helmets -- like those used for biking -- are a good safety precaution, particularly on the mountain's most dangerous terrain -- beginner slopes packed with adults skiing out of control. "The slope was full of kids waving their arms like airplanes, bouncing up and down from the knees, and singing songs"
﻿On the first day of lessons, Eve and her class of four, five, and six year olds assembled at the bottom of the beginners' Wide West slope facing the Snow Park Lodge. Two instructors took Eve and six other first timers immediately into the adjoining childcare center for an hour or so of indoor pre-ski lessons. Here they learned the rudiments of walking with the strange boards now attached to their feet. After the obligatory snack, each child, now self sufficiently carrying her own pair of skis, trotted out to the bottom of the slope. With a little help, they were all soon snapped in to their bindings and ready for their first lesson on snow. 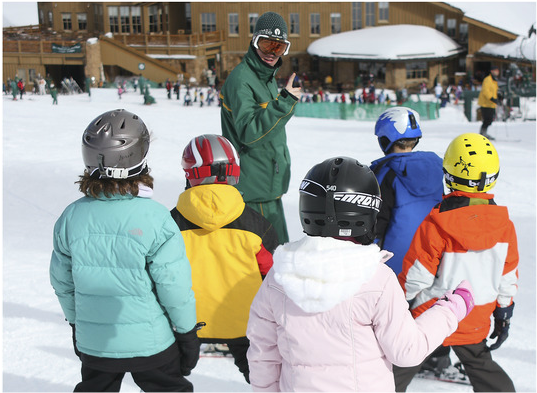 The teachers for these kids are themselves the newest of Deer Valley's ski instructors. Here, as at all ski resorts, instructors must pass this most difficult trial by fire, keeping a group of kids happy as they teach them to ski. Deer Valley boasts one of the country's better instruction programs...and during Eve's week of lessons it showed. Instructors first put Eve and her new friends on a blue rubber carpet placed on top of the snow. The carpet offers both traction [on the way up] and a break on speed [on the way down]. Once they had walked up the carpet's fifteen foot length, the instructor fitted an `edgey wedgy' between the tips of each child's skis. This wire, screwed at either end onto the ski tips, prevented the tips from wandering apart as Eve made her way downhill. She kept the edgey wedgey on for a couple of days, after which she was able to maintain a snowplow position without assistance. The morning was taken with practice runs on the carpet. That the instructors could make such progress in such a short period, and keep it fun, was no small achievement. I congradulated myself more than once for my decision not to try to teach Eve myself. The objective of the first morning's outing was typical of the seriousness with which the instructors approached this enterprise. At some resorts, minimal expectations of progress produce children's programs where learning to ski becomes almost incidental. At Deer Valley, in contrast, instructors anticipate that after just a few hours instruction each child should be able to maintain a breaking wedge, once known as a snowplow, as well as to learn how to stop. Having mastered these basic elements of control on her first morning, Eve was expected to go up the Wide West slope after lunch. My wife and I chose to make ourselves scarce during this and subsequent classes. Dori was seven months pregnant, with lots of free time to spy from the outdoor second floor of the lodge's restaurant, out of Eve's sight. I'd stay uphill of the class, or hide among the aspens. As much fun as Eve was having, whenever during our week's skiing that she saw one of us waiting at the bottom, Eve lost it, turning quickly from accomplished skier to a cranky kid insistent upon having a hot chocolate. Based upon my own experience learning to ski, I expected Eve to progress no further than the blue carpet. Indeed I would have considered that a real achievement for a three and one half year old. Oh father of little faith. After lunch, Eve headed up the mountain, on the Burns chairlift servicing the 200 foot vertical Wide West slope --a beginner's paradise. I never would have imagined that in our litigious society, a ski school would routinely put four year olds on open chairlifts, with no restraining bars or foot rests, even for the five minute ride to the top of the slope. Raio is very sensitive to this issue, but he views the chairlift ride as part of the learning experience. Eve was determined to follow the instructions for proper chairlift etiquette. Lift operators routinely assisted the instructors, who rode the lift with a child on each side. The operator pushed Eve from the liftline gate into the path of the oncoming chair. Eve hopped onto the lift and immediately wrapped one arm around the sidebar. I admit to watching nervously from the next chair as I followed Eve, who was perched almost on the edge of the seat about twenty feet off the ground, to the top. But she put her ski tips up like a pro, and scooted effortlessly off the chair for the short run down the endramp. With the help of the edgey wedgies, wide snowplow turns and controlled stopping came amazingly quickly and easily to the group. The slope was full of kids waving their arms like airplanes, bouncing up and down from the knees, and singing songs known only to them as they made their serpentine way down the mountain. It often seemed that they spent more time lined up on the fall line, their little legs in an arcing `V, than actually skiing. One of the group was invariably trying to right himself after a fall, but the kids waited patiently while the instructors put the errant ones right. On the afternoon of Eve's second day on skis, shortly after her class had hit the slopes after lunch, Dori noticed that Eve was not among those in the liftline. As she surveyed the row of moving chairs, she was startled to see a solitary shape in mint green alone on a chair. Eve had decided that she preferred to ride by herself and, more to the point, her instructors had okayed it. After tasting such independence, I had a hard time convincing her to let me ride alongside her on our early morning runs before ski school. More often than not, I'd watch the lift attendant put her on and follow in the next chair, instructing her as we rode never, "I mean NEVER", to turn around when she talked to me. As the week progressed, Eve and her classmates learned to ski through a course made of orange cones, and ran dual slalom races through red and blue gates. Like most kids, Eve failed to see the purpose of turning. It took effort and slowed you down. She much preferred to maintain a high speed snowplow profile, singing as she schussed straight down the slope. Towards week's end Eve got her wish. One morning, Eve's class disappeared from the Wide West slope. I was told that they had gone up the Carpenter lift -- the very one she had targeted upon our arrival -- to ski the appropriately named Success trail, a bona fide beginner-intermediate run that makes its way down 1200 feet from the 8400 foot summit of Bald Eagle mountain. The next day, our last, the two of us got on the Carpenter lift together. Eve was the best ski buddy I'd had in a long time. We took turns leading and following each other down the trail. I tried vainly to slow our descent by making long traverses across the fall line. Eve set her own downhill course, taunting and teasing me as she went. She cruised fearlessly, stopping only when I pleaded and threatened. And she'd learned her most important and unforgettable lesson of the week. Skiing is fun. $15 pp each way from airport to your Deer Valley destination. Child day pass $23 per day or $120 for six days. 3 and 4 year old beginners one hour private lesson, lunch, and activities in the child care center. Childrens' skis, boots, and poles[if required] $16 per day.